It's a bird, it's a plane...it's your dinner on your plate! For this recipe, you can put the pork in a slow cooker for 4 hours on high or 8 hours on low -- aka let it cook while you're at work -- then shred the pork and bake the nachos with all your fixings in the oven for 8-10 minutes. The only way this is getting easier is if your order nachos. Get our recipe for Pulled Pork Nachos. Get them from Amazon: 2-quart slow cooker for $7.69 and 6-quart slow cooker for $49. 2. Make things even simpler by freezing some slow cooker "dump dinners" that have all the stuff you need to throw in there in the morning. Put all the chopped, prepped ingredients into a labeled freezer bag and store for as long as three months. The night before you plan to make the meal, put the bag in the fridge to thaw and in the morning, dump the contents into your slow cooker. Let it cook during the day and come home to a hot meal. Learn more on New Leaf Wellness. 3. Limit yourself to a one-pan recipe that bakes in the oven while you do other stuff. You'll have less clutter while cooking and less dishes to wash afterward. Try our One-Pan Lemon Herb Salmon recipe. Eat one serving and then box up the other three for even quicker dinners later! Get a three-piece baking sheet set from Amazon for $12.26. 4. 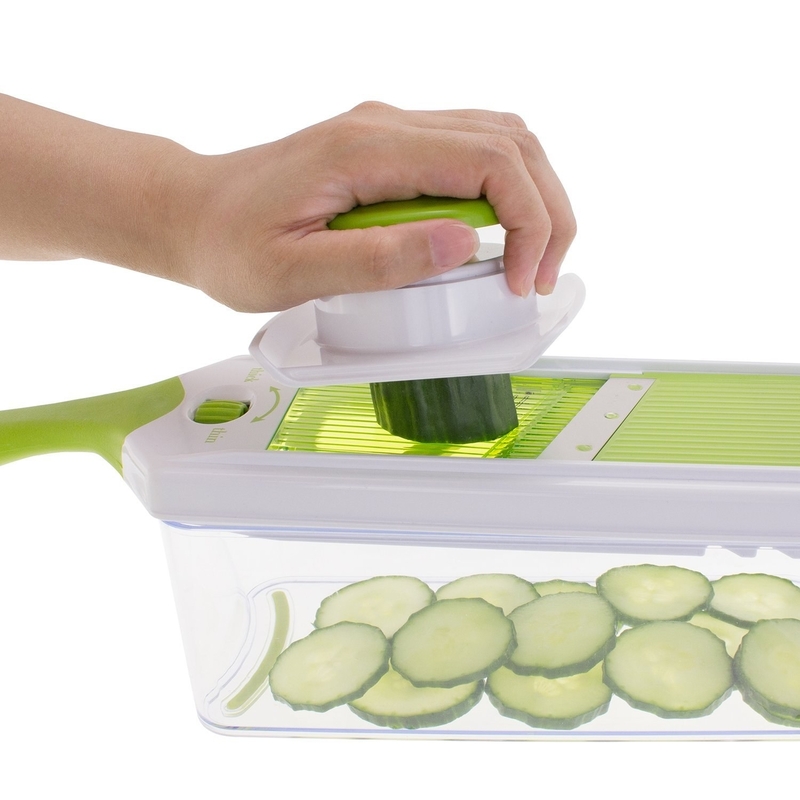 Outsource your veggie chopping to this 7-in-1 slicer that'll catch your chopped ingredients until you're ready to dump them into a dish. Get you a gadget that can do both. And then five other things. Then learn how to chop seven types of veggies in mere seconds here. Get it from Amazon for $18.08. Also available in a 2-in-1 and 4-in-1 version. 5. Pick a few like-minded grain-based recipes and prep a big batch of grains that you can use for multiple meals and dishes. Keep big bags of ~dry~ grains in your pantry and pick a kind of grain to prep at the beginning of the week for use in dinners. It's one less step to figure out when you're fixing a quick meal. TBH, you can easily swap some grains for others in recipes. Start with this post for a week's game plan. 1 big batch of quinoa can work for Korean Bulgogi BBQ Steak Bowls (#2), Ahi Tuna Quinoa Poke Bowl (#3), Cuban Quinoa Bowl With Spicy Lemon Cashew Dressing (#8), The Mother of All Veggie Bowls (#9), Hippie Bowls (#10), Honey Chipotle Chicken Bowls (#16), and/or The Big Vegan Bowl (#17). Get a 2 lbs. bag of pre-washed quinoa from Amazon for $10.99. 6. Spiralize veggies you'll use later in bulk...and then freeze them. Throw them in dishes like this Rainbow Vegetarian Pad Thai that require sauteeing the veggies for a bit. Read the full recipe on Pinch of Yum. 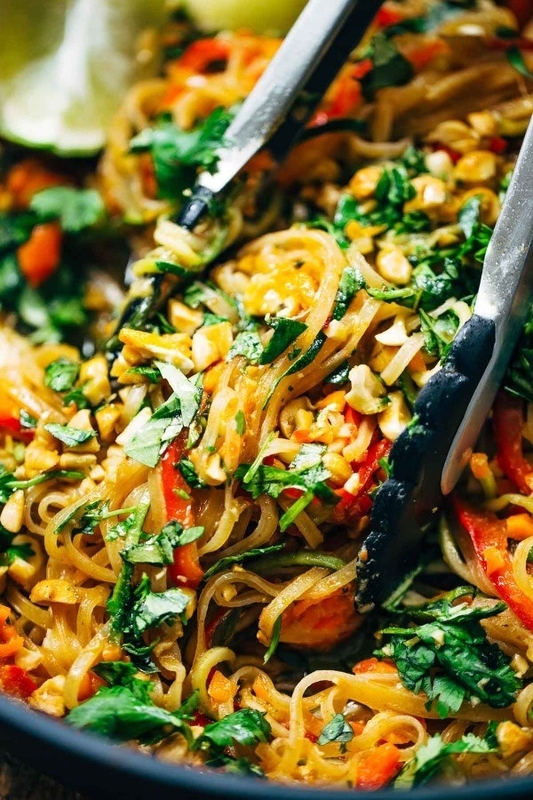 And check out 21 Delicious Veggie Noodles Recipes. 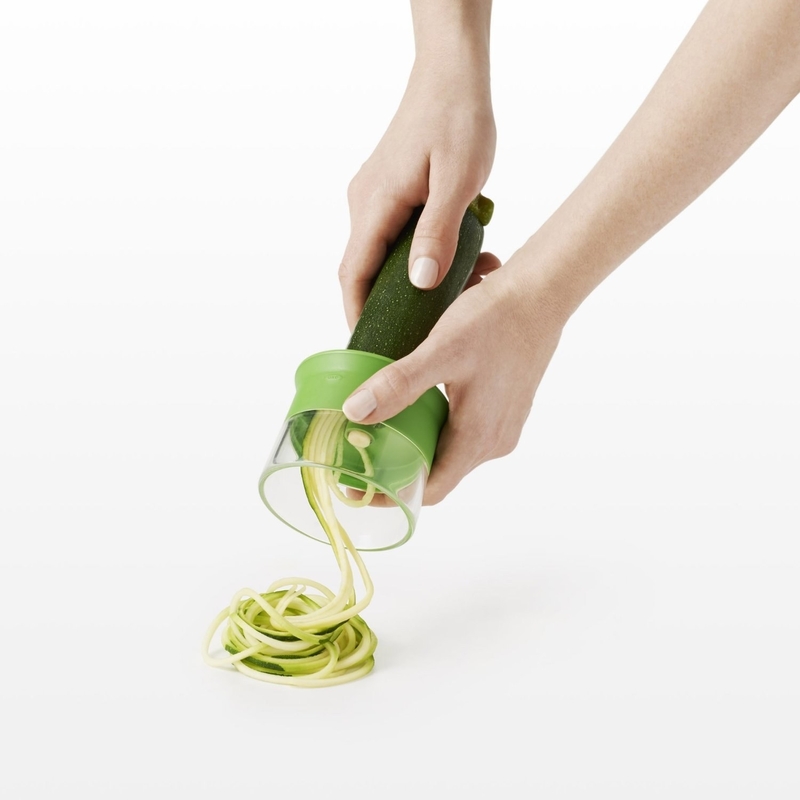 Get a spiralizer from Amazon for $14.95. 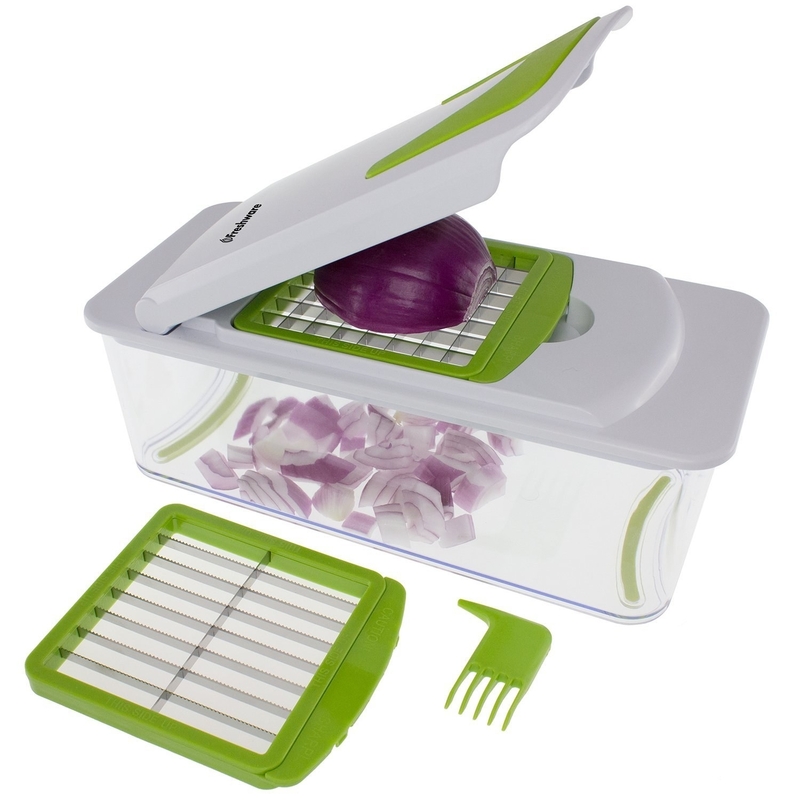 Also available with two blades or three blades. 7. Meal prep like you're feeding a family of four...but keep it all for yourself. You'll (likely) spend as much time with food prep as you would for one serving and can make three more meals out of it. Better yet, find a recipe that's a ~healthier~ dupe for a restaurant fave, like our Chipotle taste-alike Chicken Burrito Bowls recipe. Divvy up the goods into four containers and you'll have three more microwavable meals later. 8. Fall for a DIY salad dressing recipe and keep it in a dressing shaker in your fridge for everything-but-the-kitchen-sink salads and bowls when you're trying to use up produce. Get this salad dressing shaker from Amazon for $12.99. 9. Shop your own pantry by putting essentials like canned tuna to work in new dishes you won't believe. Read the full recipe for this Skinny Tuna Noodle Casserole on Skinny Taste. And check out 23 Cool Things To Do With Canned Tuna. 10. Zero in on the holes in your food stores with this handy pad that'll help you replace stuff when you need it. No more wasting time by dragging out all the ingredients for Sweet Potato Hash and realizing you have zero sweet potatoes. Whip up these Grab-n-Go-Breakfast Quesadillas and then go to your couch. Eat them in your hand without a place and you'll save time by not washing a plate! Make tortillas work for your dinner with our 29 Life-Changing Quesadillas You Need To Know About. 12. Park this 8-in-1 kitchen tool set on your counter so you'll spend less time searching for a funnel or measuring cup. 13. Add restaurant leftovers to home-cooked meals, like some spicy chicken from a salad to this Easy Breakfast Frittata. Or some rolls you nicked from a bread basket as buns for these Pulled Porchetta Sandwiches. It's one less part you have to cook/worry about. Check out our recipes for the Breakfast Frittata and Pulled Porchetta Sandwich. Need some more ideas? Read 18 Ways to Transform Homemade Leftovers into Meals. 14. 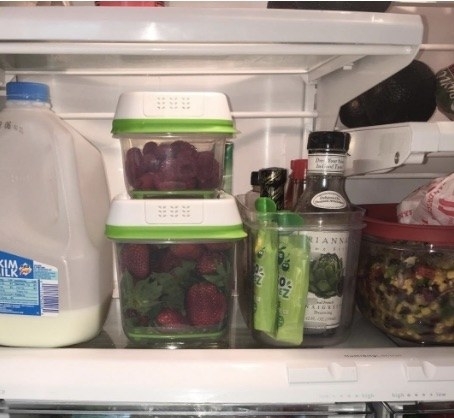 Transfer fresh produce you need to use ASAP to storage containers and put them front and center in your fridge, so you can cut down on search time for those strawberries for a salad. Get excited about that kale you just bought and need to use with these 7 Ways to Make a Better Kale Salad. And while you're at it, learn How to Store Everything in Your Fridge. 15. Transform pre-packaged food like dried ramen noodles into dishes that'll wow your Insta followers -- like this Tonkotsu Ramen. See the recipe for this Tonkotsu Ramen on Curious Nut and learn about 14 Creative Ways To Use Packaged And Canned Food. Get 36 packs of chicken-flavored ramen from Amazon for $22.50. 16. Rapidly chop flavorful herbs for your recipes with these kitchen scissors. Test out your new chopping skills on our recipe for Shrimp and Cauliflower "Fried Rice." 17. Hang your pots and pans — and lids — so you won't have to spend 10 minutes digging through your cabinets. Soak up some more no-fuss tips from our 19 Ways To Cook Faster. 18. Find a new twist on a quick, OG favorite -- like pizza grilled cheese -- so you feel like you're cooking dinner on auto pilot. The process is the same as a regular grilled cheese, but it's a quick and dirty homemade meal you can ~actually~ look forward to with exciting ingredients. Watch our Pizza Grilled Cheese video. And read our tips on How to Eat Pizza for Every Single Meal. 19. Set it and (almost) forget it with this rapid egg cooker that'll get them the perfect consistency for any recipe. It'll make six hard-, medium-, or soft-boiled eggs, individual omelets, two poached eggs, or scrambled eggs. Start cooking with our 15 Tasty Ways to Work Eggs into Every Meal. Get it from Amazon for $18.61+. / Available in four colors. 20. Throw all your leftovers and about-to-wilt stuff in a big, beautiful bowl -- with this Mediterranean Bowl for inspo. Live each day like you're eating at an overpriced "bowl" restaurant! See The Ultimate Mediterranean Bowl recipe on Minimalist Baker. And check out 10 Insanely Delicious Vegetarian Bowls for more bowl combo ideas. 21. Keep a stocked pantry! It isn't rocket science, but it helps. So. Much. Consider our 23 Ingredients You Should Always Have In Your Kitchen and make sure that you're storing said ingredients properly in jars like these or other sealed containers. 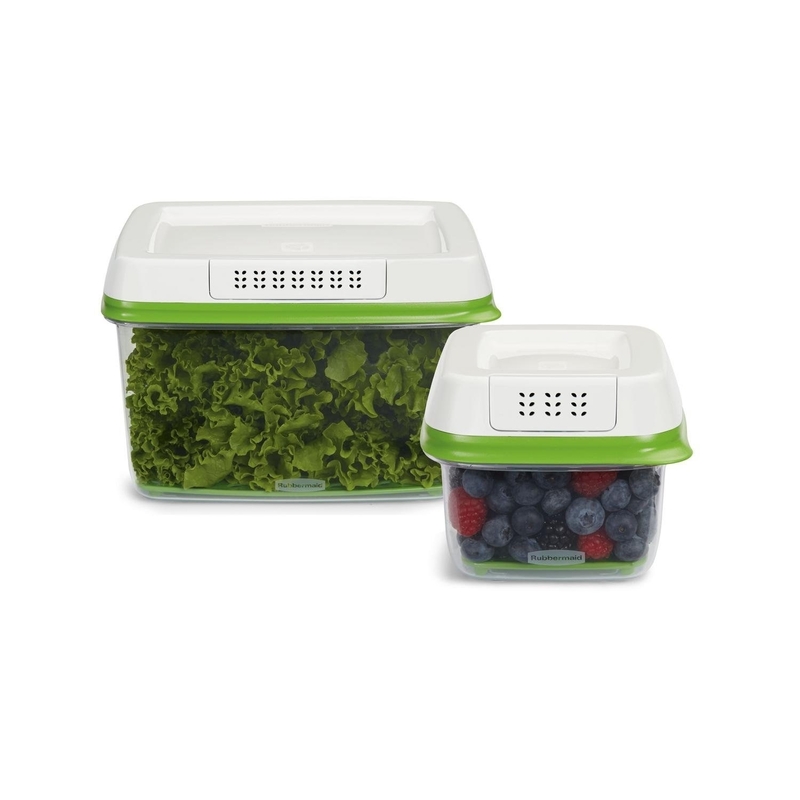 Get these airtight, drop-proof containers from Amazon for $22.95. 22. Find some 15-minute recipes for dishes you already love to make eating (kinda) like a breeze. Satisfy a pasta craving with this Shrimp Scampi recipe from Damn Delicious. And get more ideas from 15 Delicious Shrimp Dishes You Can Make In Just 15 Minutes. 23. Organize your spices so you can zero in on that tiny little bottle of paprika or celery salt. Get a set of these spice gripper clips from Amazon for $7.95. 24. Fall back on these energy boosting toast ideas for some surprising topping combos that you already have in your kitchen. Remember that whole breakfast-for-dinner thing? We dare you to come up with a better way to use up that loaf of bread. Read all our genius toast ideas.